There are times when a clear partition provides a distinct advantage over traditional fabric-covered partitions. Use clear room dividers when you need to control or contain an area but still need to have an unobstructed view of what’s happening on the other side of the barrier. See through walls are great for a number of settings, from schools to offices to science labs. Security Wall – Clear partition walls are ideal for security situations in airports, hotels, or school lobbies because they allow you to restrict access and also see what is beyond the barrier. They are also a great way to create cooperative learning environments in classrooms or libraries. Since you can write on them, using rolling, translucent wall panels allow you to post information without being tied to a wall, and it won’t block your view of the rest of the room. You can use see-through walls in educational settings such as classrooms, student unions, cafeterias, and lobby spaces. A clear partition is also ideal for restaurants, open-concept kitchens, and museums. Inclement Weather Barrier – We got this great tip from several customers who have used their acrylic room partition to reduce or control drafts and temperature fluctuations in lobby areas. 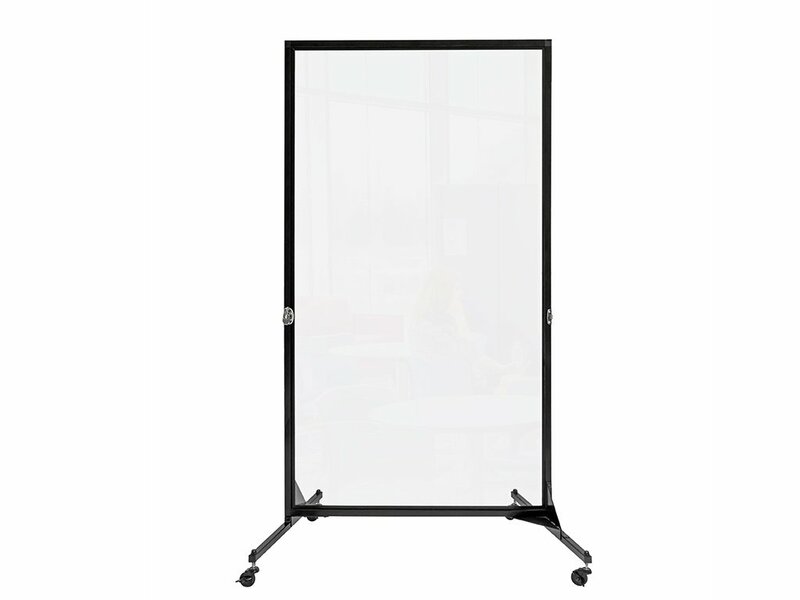 Simply, place a three-panel clear mobile divider inside the entrance or a series of connected clear dividers in front of a bank of entry doors to reduce the force of cold exterior air from entering a lobby space. We tried it and it made a big difference. Permanently attached panelock secure divers panels in any position desired with just a twist of the knob. Hinges will lock in place from 0 to 180 degrees. 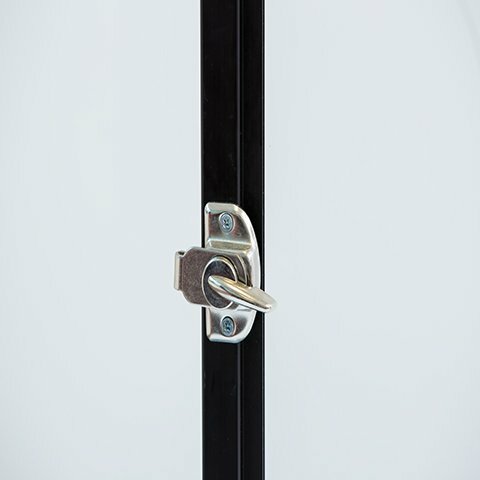 Black metal locks can be retrofit to any Screenflex divider. 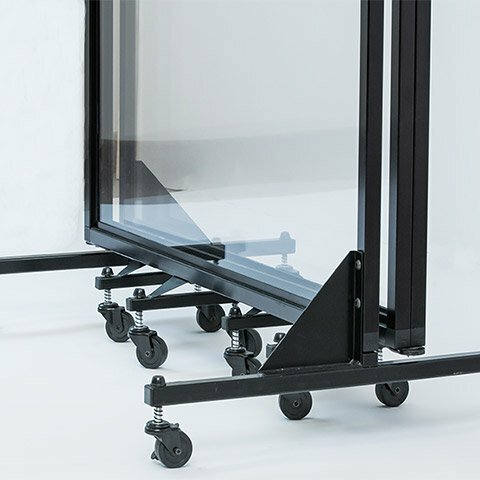 ONLY Screenflex uses self-leveling casters on our room dividers to conform to the dips and rises in a floor’s surfaces. Amazing compact storage. Folds compactly for a storage in a 28" by 40" space. 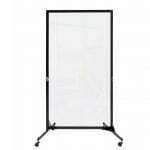 This movable clear divider provides sturdy extruded aluminum channel framing with a black anodized finish. Conveniently use with wet erase and liquid chalk markers. Wipe clean with a damp cloth. A set of chrome plated Multi-Unit Connectors installed on the end of each Screenflex Room Divider allows you to customize the length of your room divider. A simple turn of the latch joins dividers together to form the length you desire. Connectors may also be used to attach dividers to a Screenflex Wall Frame for a more permanent room divider solution. 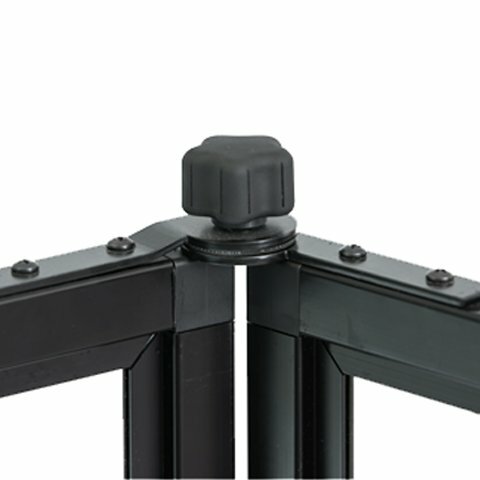 Thank you for the feedback regarding an issue with the end support base on the dividers that were purchased. It is our intent to manufacture our dividers with quality and safety being top priorities. 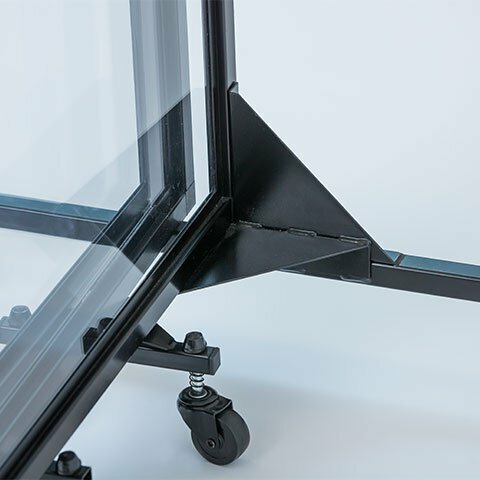 It is imperative that the width of the end support base be 26 1/2″ to ensure maximum stability. Due to the manner in which the dividers are being used, it is understood that this may not be the best product to meet your needs. We appreciate knowing that your buying experience was good and that the Sales Consultant was helpful. We will work expeditiously to coordinate the return of the dividers and do appreciate your interest in Screenflex. We are required to follow certain safety guidelines and needed something that guests can see through and be out of danger. Screenflex Clear Dividers fit within our guidelines and allow our guests to view drone testing. We needed to provide a quiet seating area in the library, but we also needed to monitor it. The clear room divider was the perfect solution. Needed multiple purpose divider for a quiet room, breastfeeding room for staff and family. Need the clear writable board for meetings etc.